Stems: Erect, stout, rough-hairy, longitudinally ridged. Leaves: Opposite; basal leaves irregularly cleft; stem leaves once or twice pinnately-divided into stalkless segments; segments not distinct leaflets; margins more or less bristly-fringed; bases of each pair of leaves joined, forming cup-like structure. Inflorescences: Heads, dense, egg-shaped to cylindrical, 1 to 4 inches tall, 1 to 2 inches wide, terminal on long stalks; involcural bracts mostly lanceolate to linear-lanceolate, 1 to 4.5 inches long, 1/8 to 1/2 inch wide, mostly shorter than mature head, spreading or curved upward, spine-tipped. Flowers: Calyx small, cup-like; corolla funnelform, about 1/2 inch long, unequally 4-lobed, whitish; stamens 4, projecting conspicuously beyond corolla; bract subtending each flower rigid, long-tapering. Fruits: Achene, 1/8 inch long, crowned by calyx; seed 1, hairy, grayish-brown. Habitat: Waste areas, weedy pastures, wet ditches, and roadsides. 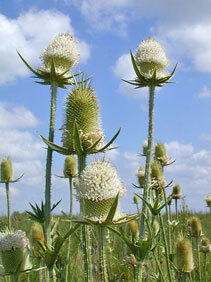 Origin: Cutleaf teasel was introduced from Europe. Comments: See also common teasel Dipsacus fullonum.